Alex Santos turned in one of the finest performances by a Hurricanes pitcher ever during the 1998 season. The Lake Worth (Fl.) High School product garnered consensus All-American honors, as he led the NCAA with 15 victories against one lone loss. He ended the year with a 2.54 earned run average with 142 strikeouts in 110 innings, an average of 11.6 K's per nine innings. He had 7 starts where he compiled 10 or more strikeouts and went 2-0 in the postseason for the Canes as they advanced to the College World Series for the 5th straight year. He played on the 1998 U.S. National Team, but decided to turn down an offer from the Los Angeles Dodgers after being selected in the 3rd round of the Major League League Baseball draft to return to Miami. It was a very wise decision. In 1999, Alex had another stellar season on the mound, compiling 13 wins against 3 losses and helping lead the Hurricanes to their third National Championship. He won 2 games in the series, and picked up the victory in the 6-5 win over arch rival Florida State in the Championship Game. Recently described by Coach Jim Morris as "one of the best players in his 17 years at UM", Alex is 2nd all-time in strikeouts (386) and 6th in career wins (37). His 15 victories in '98 are tied for the 3rd highest single season total in school history. He is tied for a school record with 8 consecutive strikeouts against arch rival Florida Gators in 1998. Alex was selected to the 1999 Verizon/CoSIDA Academic All-American team, and was also selected for the 1997 Freshman All-American team. He graduated from UM with a degree in Finance, and was tapped as a member in the Iron Arrow Society, the highest honor attainable at the university. 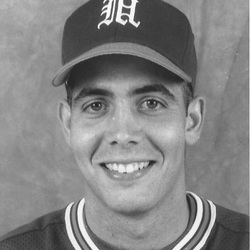 Drafted by the Tampa Bay Rays in the 1999 MLB draft, he spent 8 years in the Rays' and Oakland A's organizations. Alex is currently living in West Palm Beach with his wife Ana Maria and works as a financial advisor for Morgan Stanley Smith Barney.